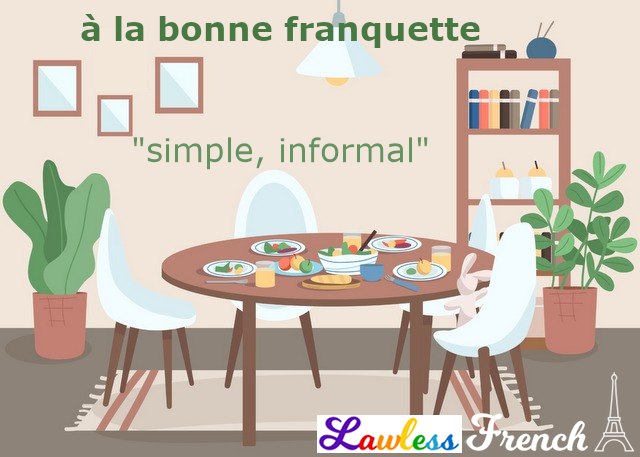 Usage notes: The informal and somewhat old-fashioned French expression à la bonne franquette is a way of describing something as simple or unfussy without any risk of insult. The word franquette, a diminutive of franc (frank, clean), is found only in this expression. C’était une visite à la bonne franquette. It was an unceremonious visit. On va manger à la bonne franquette. We’ll eat a simple meal. 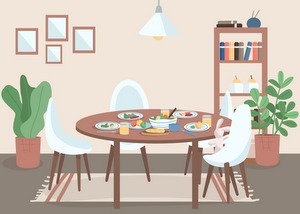 *On the few occasions where I’ve been invited to a potluck (everyone bring a dish) sort of meal, it was described as à la bonne franquette, which seemed to be a description of the simple food at such occasions, rather than the actual concept of a potluck. I’ve been told that the correct French equivalent of "potluck" is auberge espagnole, but personally I’ve never heard that term used outside of linguistic discussions. Il semble qu’au moins les Canadiens ont un mot pour “potluck”. J’ai trouvé “repas-partage” et “dîner-partage” sur linguee.fr, wordreference.com, reverso.net. Merci encore pour ton site. C’est formidable!